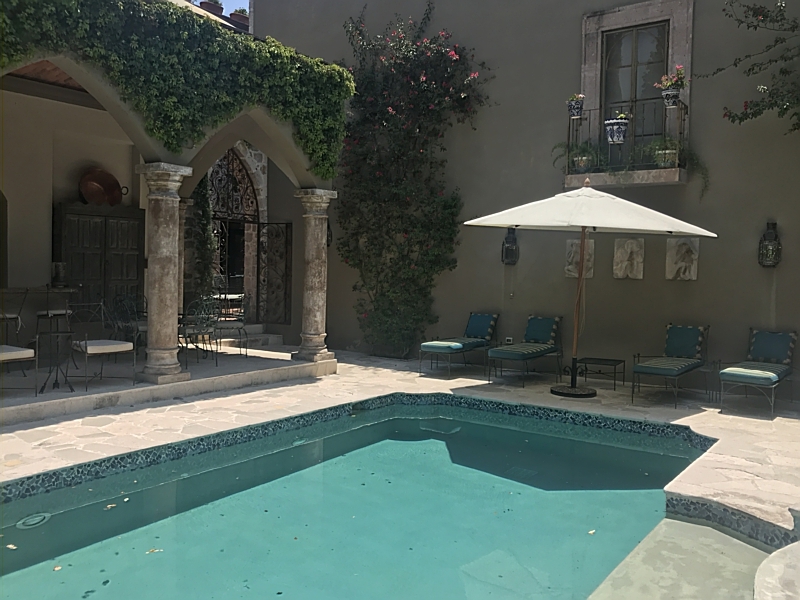 Casa Gibson is a beautiful 5 bedroom home in centro with charming Mexican decorations and Moorish design features around the house. It's an easy 5 min walk to the main square - where the Parroquia is located. The house was built in two stages. The main house has 4 bedrooms and your main living areas. It has two floors. There is one bedroom on the main floor. It has a Queen bed (Mexican Queen) - it's slight shorter than a U.S. standard size Queen with ensuite bathroom. There are French doors that lead to the outdoor sala and the sound of the fountain will lull anyone to sleep. The main living space is on this level with a beautiful and comfortable sitting and dining area combination. There is a gas fireplace in this room. The living room has French doors that open to the outdoor dining area that also has a built in gas grill. The kitchen is off the dining area and the outdoor dining area. The second floor of the main house - has 3 bedrooms all with their own ensuite bathrooms. The master bedroom has a King bed, bathtub and separate shower. Off the master bedroom is a small balcony with chairs, and you can also access the rooftop terrace from here as well. There is also a small den and office area with a TV on this floor. The 2nd bedroom mirrors the bedroom on the first floor with a Queen bed and ensuite bathroom, the 3rd and final bedroom on this floor has twin beds with an ensuite bathroom that has a bathtub shower combo. When you walk away from the outdoor dining area on the first floor you walk through gates that lead you to the newest addition to the house where you will find the swimming pool, guest house with an additional bedroom and bathroom, as well as, a bar and sitting area. This part of the house has a Moorish design with decorative pillows and sitting area. There is also a hot tub that is a fountain and flows into the pool. The guest house is two stories - as you enter you have your bathroom on the first floor, than walk up the stairs to the bedroom, where you will find another King bed. There house has some great outdoor spaces, and you will have plenty of room to find your "spot" to rest and relax. It's truly an oasis right in centro. The cook can prepare one meal a day - her hours are Monday - Friday 9-3 and Saturday 9-12. If you want her to prepare lunch and serve it past 3pm, than the client pays her overtime. Food is not included in the price, but we are happy to pre-shop for you prior to your arrival, than the staff can help you once in the house. 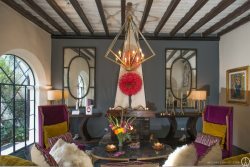 We look forward to hosting you in Casa Gibson! !